On the evening of Wednesday, Nov. 14, hundreds of people gathered outside of Rackham Auditorium, waiting to attend the annual Wallenberg Lecture — where the Wallenberg Medal is awarded every year to people that play significant roles in social justice activism. This year, history was being made: the medal was being awarded to two youth groups, both working to fight gun violence. One of the groups was March for our Lives from Parkland, Florida. After a gunman murdered 17 people in Marjory Stoneman Douglas High School on Feb. 14, 2018, students joined together to fight gun violence. Two of those students were Alex Wind and Sofie Whitney, who accepted the Wallenberg Medal on behalf of the group. The second medal-receiving group was B.R.A.V.E. (Bold Resistance Against Violence Everywhere), an anti-violence youth movement working out of the south side of Chicago. They have organized several anti-gun movements, including a march to shut down Chicago’s 79th Dan Ryan expressway. Rie’Onna Holmon and Ke’Shon Newman, two leaders of the organization, accepted the medal. The evening began with the University of Michigan’s Assistant Dean of International Affairs, John Godfrey, presenting an introductory speech about the history behind the Wallenberg medal: it was named in honor of Raoul Wallenberg, who was born in Sweden in 1912 and graduated from the University of Michigan in 1935, holding a B.A. in Architecture. In 1944, after travelling and working in business, Wallenberg was sent by the Swedish government to Budapest, where the city’s Jewish population was being decimated every day. Among other measures he took to save Hungary’s Jews, he invented and distributed a Swedish passport called the Schutzpass, ruling that it gave the holder amnesty from deportation to concentration camps. The Schutzpass is praised for saving over 20,000 lives. One night in 1945, Wallenberg was arrested by Soviet guards. He was never heard from again. The Raoul Wallenberg medal was created to honor humanitarians. The front carries a portrait of Wallenberg, surrounded by the slogan “One person can make a difference.” This year was the first year in the history of the award that it was given to an organization. The president of the University of Michigan, Mark Schlissel, presented the medals to the four students. “Our honorees have demonstrated a level of engagement that is desperately needed in our country,” Schlissel said. 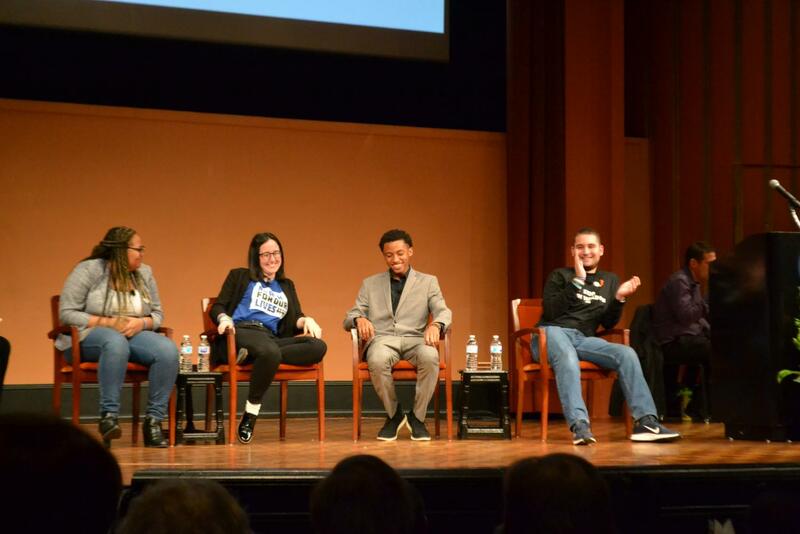 After receiving standing ovations and the Wallenberg medal, Wind, Whitney, Holmon and Newman sat down for the discussion portion of the evening, which was led by Godfrey. He gave each student a chance to tell their own personal stories before asking any questions. Wind went first, discussing the shooting that had occurred at his high school exactly nine months earlier. He went on to urge audience members to call their government representatives and demand legislation that prevents gun violence. He reminded the audience that their voice matters, and they should speak up about things they care about before it’s too late. Newman was next to share his story. He became active in the fight against gun violence when, on May 2, 2016, his brother was shot nine times and killed. He didn’t want his brother to become another statistic. He said that being a part of B.R.A.V.E. gave him a second chance at life. Whitney started off by talking about the moment of the shooting. She said that she took seven steps outside of her drama classroom and heard gunshots. She went on to talk about organizing the March for Our Lives, saying that it’s become much more than Parkland; it’s cities and towns everywhere that are affected by gun violence every day. She reminded the audience that there is no age limit to change. Holmon began her speech with a call and response activity with the audience. Holmon got involved in B.R.A.V.E. because her brother was a founding member. She wanted to bring attention to and stop the violence that occurs in Chicago every day; this year, over 300 people have died in Chicago alone due to guns. She also addressed the personal trauma she felt when her bus to school was caught in crossfire. Godfrey then asked the four students questions from the audience, which had been written on notecards and passed up to the stage. The first one asked whether or not the student activists wanted help from adults. The four talked about a number of things they needed adult help with, such as resources, legal help and voting. However, they made sure to draw the line between support and overstepping. The next question sparked an interesting discussion: What is the hardest thing you have faced in organizing? Being heard, according to Holmon, was the most difficult thing. She said unless B.R.A.V.E. did a huge protest, no one even cared enough to glance their way. She also added that when people talked about B.R.A.V.E. students, they portrayed them as angry black kids; when they talked about students from Parkland, they called their efforts passionate and heroic. Wind said the hardest thing for him was the politicians’ responses. When he went to Washington, D.C. two weeks after the shooting, the politicians he met with didn’t seem to care. He said they had to make sure there were no photos in their meetings to guarantee that the meetings weren’t just photo ops. The final question of the evening was lighter in content: What do you do for fun?